Waterford defeated London by 2-16 to 1-8 in Round 1 of the Allianz Football League Division 4 on Sunday February 5th at Ardmore. Waterford claimed a morale-boosting victory against London as Paul Whyte and Patrick Hurney pulled the strings at Ardmore. The fluent home team carved open the London back line but passed up on five one-on-ones before Whyte tucked the ball away on 49 minutes. The captain skied a first-half penalty right and wide yet they recovered to lead 0-9 to 0-5 at the interval. In injury time, Stephen Dalton pulled down London’s Rory Mason and Barry Tiernan signalled a penalty. The defender got a black a card and Mason sent Stephen Enright the wrong way. Scorers – Waterford: P Whyte 1-5 (2fs); P Hurney 0-6 (3fs); G Crotty 1-0; D Breathnach 0-2; B Looby, M Curry, C Murray 0-1 each. London: R Mason 1-4 (1-0 pen, 3fs); L Gavaghan 0-4. Waterford – S Enright 7; B Looby 7, T O’Gorman 7, T Ó hUallacháin 6; J McGrath 6, S Prendergast 7, R Ó Ceallaigh 6; T Prendergast 7, M Curry 7; M O’Halloran 6, P Whyte 8, C Murray 6; D Breathnach 7, J Veale 6, P Hurney 8. Subs: G Crotty 7 for O’Halloran (49); F Ó Cuirrín 6 for Murray (49); F Galvin 6 for Ó Ceallaigh (57); L Lawlor 6 for Veale (57); S Dalton for S Prendergast (62); K Murphy for Dalton (BC, 72). London – C Hallissey 7; C Carty 6, C O’Neill 6, C Coyne 6; J Branagan 6, P Butler 5, R Jones 6; A McDermott 6, J Gartlan 6; E Murray 6, M Gottsche 6, L Gavaghan 8; R Mason 7, A Moyles 5, J Daly 5. Subs: K Hughes 5 for Moyles (47); M Carroll 5 for Gartlan (47); C Dunne 5 for P Butler (BC, 48); K Butler 5 for Daly (54). Ref – B Tiernan (Dublin). This entry was posted on Sunday, February 5th, 2017 at 12:00 am and is filed under events, News. You can follow any responses to this entry through the RSS 2.0 feed. Both comments and pings are currently closed. Wexford defeated Limerick by 0-14 to 1-8 in Round 1 of the Allianz Football League Division 4 on Sunday February 5th at Innovate Wexford Park. Limerick senior football manager Billy Lee and his selectors has named their team to face Wexford in the opening round of the Allianz football division 4 league. Following a good performance against Kerry in the McGrath Cup final recently the management team has released the following team and panel for Sunday’s game in Innovate Wexford Park at 2pm. 1. Donal O’Sullivan (Monaleen), 2. Daniel Daly (Fr Caseys), 3. Johnny McCarthy (St Kierans), 4. Sean O Dea (Kilteely/Dromkeen), 5. Paul White (Rathkeale), 6. Iain Corbett (Newcastlewest) (Captain), 7. Cillian Fahy (Dromcollogher/Broadford), 8. Darragh Treacy (St Kierans), 9. Brian Fanning (Pallasgreen), 10. Peter Nash (Kildimo/Pallaskernry), 11. Ger Collins (Monaleen), 12. Danny Neville (Ballysteen), 13. Sean McSweeney (St Kierans) 14. Seamus O Carroll (Cappagh), 15. Jamie Lee (Newcastlewest). Tipperary defeated Antrim by 2-12 to 0-13 in Round 1 of the Allianz Football League Division 3 on Sunday February 5th at Semple Stadium Thurles. Tipperary 2-12 Antrim 0-13: A much-improved second-half display saw Tipperary claim an opening day victory over Antrim in Division 3 of the Allianz Football League. Goals from All Star Michael Quinlivan and Philip Austin were pivotal as the Premier County, last year’s All-Ireland semi-finalists and one of the leading contenders for promotion, won by five points in front of 722 spectators at Semple Stadium. Tipp were four points down in the first half, and trailed by 0-5 to 0-7 at the break, but a more direct approach in the second period bore rich dividends. Both of Tipp goals came from long Alan Moloney deliveries from midfield, with Conor Sweeney providing the assists. Quinlivan profited in the 56th minute before Austin claimed the second goal with six minutes remaining. It was encouraging stuff from Tipp, who were two points down before turning the screw. With the breeze at their backs in the second half, and kicking towards the Town End, Tipp showed fine game management to win a first round league game for the first time since 2014. Both teams finished the game with 14 players as Tipp had used all six subs when they lost a second player, Willie Connors, to a black card. And Antrim were a man light for the closing seconds when Conor Murray was dismissed for a second bookable offence. A black card for Ryan Murray at the end of the first half cost the visiting Saffrons. Murray had been motoring well before he was handed his marching orders, a hotly-disputed decision but arguably correct as the forward appeared guilty of a hand-trip. Murray’s replacement, CJ McGourty, did well but also missed a couple of straightforward chances from frees. Antrim were also unlucky to see two point efforts in the first half denied by the upright, while Tipp goalkeeper Evan Comerford did well to keep out a palmed Stephen Beatty effort. Comerford’s opposite number, Chris Kerr, saved well from Quinlivan early in the second half but he would have to pick the ball out of his net twice as Tipp broke through. Tipp manager Liam Kearns reflected: “I wasn’t happy at half-time, we were poor in the first half. We were very rusty and made a lot of mistakes and basically they showed more aggression and were more at it than we were. Scorers for Tipperary: P Austin (1-2); C Sweeney (0-4, 2 frees); M Quinlivan (1-0); J Keane (0-2 frees); K Fahey, R Kiely, L McGrath (f) & B Fox (0-1 each). Scorers for Antrim: C.J. McGourty (0-4, 2 frees); R Murray (0-3, 2 frees, 1 sl); P McBride & M Fitzpatrick (0-2 each); P McAteer, C Murray (0-1 each). TIPPERARY: E Comerford; A Campbell, P Codd, W Connors; K Fahey, R Kiely, J Feehan; A Moloney, M Dunne; J Keane, L McGrath, B Fox; C Sweeney, M Quinlivan, P Austin. SECOND HALF GOALS from All-Star Michael Quinlivan and Philip Austin helped Tipperary to gain a winning start in Division 3 of the Allianz Football League. The Premier County overturned a four-point first half deficit to win by five in front of 722 spectators at Semple Stadium. Both goals arrived following long deliveries from Alan Moloney, with Conor Sweeney providing the assists. With Tipp a point down, 0-10 to 0-11, Quinlivan’s 56th minute goal was a crucial score and when Austin pounced six minutes from time, the points were secure for the hosts. But it wasn’t all plain sailing for Tipp, who were 0-5 to 0-7 behind at the end of a disappointing first half. Antrim packed bodies behind the ball and Tipp found it difficult to find a way through, before a more direct approach in the second half paid rich dividends. Antrim suffered a real blow approaching half-time when lively forward Ryan Murray was black-carded for an apparent hand-trip, a call hotly-contested by the Saffrons. C.J. McGourty came on to score four points but he was also responsible for some poor second half misses. After Evan Comerford did well in the first half to keep out Stephen Beatty’s palmed effort, his opposite number and Antrim goalkeeper Chris Kerr pulled off a fine save from Quinlivan early in the second half, diverting the ball onto the post. By then, Tipp had gone ahead for the first time in the game but Antrim – who were 0-7 to 0-3 up in the first half – rallied to lead by 0-11 to 0-9, before the Premier County scored the crucial goals. In stoppage time, Tipp lost captain Brian Fox and debutant Willie Connors to black cards. With all six subs used, the loss of Connors left Tipp playing the closing seconds a man light. And Antrim were reduced to 14 players when Conor Murray was dismissed for a second bookable offence. Scorers for Tipperary: Philip Austin 1-2, Conor Sweeney 0-4 (2f), Michael Quinlivan 1-0, Josh Keane 0-2f, Kevin Fahey, Robbie Kiely, Liam McGrath (f) & Brian Fox 0-1 each. Scorers for Antrim: C.J. McGourty 0-4 (2f), Ryan Murray 0-3 (2f, 1 sl), Paddy McBride & Matthew Fitzpatrick 0-2 each, Paddy McAteer & Conor Murray 0-1 each. 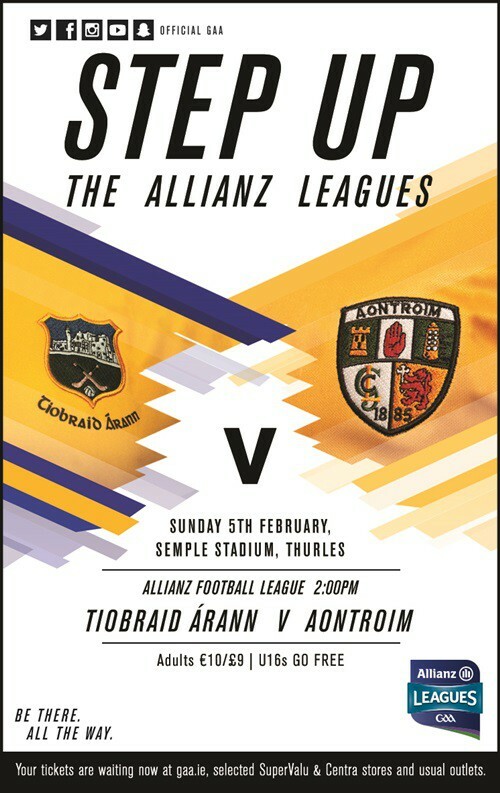 The Tipperary football team to play Antrim in Round 1 of the Allianz Football League Division 3 encounter in Semple Stadium on Sunday next, February 5th at 2pm has been announced by manager Liam Kearns. The captain for 2017 is Brian Fox from Éire Óg Annacarty-Donohill and there is a league debut for Willie Connors (Kiladangan) while Liam McGrath (Loughmore-Castleiney) also gets a debut league start having come on as a replacement in previous campaigns. After taking a year out Killenaule’s Paddy Codd returns to the full back position, as Kearns names a strong team for Tipperary’s opening fixture. Derry and Clare drew (0-11 to 1-8) in Round 1 of the Allianz Football League Division 2 on Sunday February 5th at Celtic Park, Derry. Derry twice fought back from a point down in the closing minutes to rescue a merited draw against Clare in the Allianz Football League Division 2 encounter at Celtic Park. James Kielt stepped forward and secured an equaliser in the sixth minute of injury time, levelling the scores for the seventh time in this Allianz Football League Division Two opener. Ciaran Russell thought he’d won it for the visitors when he nudged them ahead deep into the five minutes of allotted stoppage time, but there was still time for Kielt to salvage a point for an inexperienced Derry line-up. Jamie Malone’s goal for Clare after 43 minutes looked like a decisive score in a tight game but Derry battled hard to take something from the game. Clare, last year’s Division Three champions, finished with 14 players having used all six substitutes by the time Dean Ryan picked up their third black card in the 70th minute. All Star footballer Gary Brennan started for the Banner, less than 24 hours after starring for Ballyea in their All-Ireland club semi-final win over St Thomas, and he had a big impact, setting up numerous scores. In contrast, Derry were missing their Slaughtneil contingent and started with four league debutants in defence. In a low intensity first half, there were more wides than points as both forward lines struggled to turn possession into scores. Enda Lynn continued his good pre-season form with a point from play off each foot to put Derry two points ahead. Ciaran Russell and Eoin Cleary (free) levelled it up for the visitors. James Kielt kicked the first of his two first-half points from play with Carlus McWilliams tagging on another to restore Derry’s two-point advantage. Liam Markham and then Sean Collins’ long-range point tied the scores again and Cleary’s free put Clare ahead briefly for the only time. Both first-half goal chances fell to Clare; Sean Collins’ tame shot was easily saved by Thomas Mallon and later, Jamie Malone saw his strong shot low fly wide of the far post. Mark Lynch uncharacteristically missed three frees for Derry, though two them were from difficult angles, with the home side struggling to convert possession into scores. Kielt and McWilliams were on target for the second time to nudge Damian Barton’s side ahead 0-06 to 0-05 at the break. Malone palmed the ball into an empty net for the only goal of the game after Shane Brennan drew the ‘keeper and slipped the ball across for a simple finish. That put Clare 1-05 to 0-06 in front. Derry struggled to convert placed balls with Mark Lynch and Niall Loughlin missing several chances but the pair did both convert to draw Derry level. David Tubridy and Russell both thought they’d done enough to clinch it for Clare in the closing minutes but Derry dug deep to take something from the game. NEXT WEEK: Derry head south to Navan for a 3pm clash with Meath on Sunday, Clare face another Ulster side as they welcome Down to Ennis at 2pm. Derry (SF v Clare): T Mallon; N Keenan, C Nevin, R Murphy; N Forester, M McEvoy, M Craig; C McAtamney, J Kielt; E Lynn, N Loughlin, C McWilliams; M Lynch, E McGuckin, B Heron. Kerry defeated Donegal by 2-17 to 1-17 in Round 1 of the Allianz Football League Division 1 on Sunday February 5th at O’Donnell Park, Letterkenny. Kerry claimed their first opening league win since 2012, their first in Éamonn Fitzmaurice’s reign, with an utterly convincing display in Letterkenny. The majority of the 6,329 crowd were left disappointed but there was plenty to admire from the visiting team’s performance particularly from David Moran and Paul Geaney who collected 2-4. The full-forward line of Geaney, James O’Donoghue and Jack Savage helped themselves to a tasty 2-10, 2-7 from play. The game was truly up as a contest in the 44th minute when Geaney claimed his second goal courtesy of some great foot-passing and quick thinking involving Moran that originated from a Kerry kick-out. The score put them nine up and out of touch for a youthful Donegal outfit that put a better complexion on the scoreboard by the end. Kerry weren’t first on the mark but they were much the better in the opening quarter despite losing Shane Enright to a serious-looking injury, which required several minutes of attention. Savage sent over a brace of points after it and Enright’s replacement Jack Barry added another in the 19th minute. Donegal responded with a Michael Murphy free before Martin O’Reilly was fouled in the penalty area after a sparkling run in the 23rd minute. Murphy converted the penalty and Donegal were up but only briefly as Geaney found the net at the other end a minute later when Barry found him in space. Donnchadh Walsh sent over his second point shortly afterwards and Kerry were three up and full value for it give the damage they were causing down Donegal’s right flank while Paddy McBrearty found himself isolated on too many occasions. Ciaran Thompson brought Donegal within two points but Kerry were excellent in the seven additional minutes due to the earlier lengthy stoppage, kicking five points without reply. Murphy added a free to leave it 1-11 to 1-5 going into at half-time but the writing was on the wall. Scorers for Donegal: M. Murphy (1-3, 1-0 pen, 0-3 frees); P. McBrearty (0-4, 3 frees); C. Thompson (0-3); D. O’Connor (0-2); M. Reilly, E. McHugh, P. Brennan, R. McHugh, C. Gibbons (0-1 each). Scorers for Kerry: P. Geaney (2-4, 0-2 frees); J. O’Donoghue, J. Savage (1 free) (0-3 each); D. Walsh (0-2); J. Barry, T. O’Sullivan, J. Lyne, D. Moran, P. Murphy (0-1 each). Subs for Kerry: J. Barry for S. Enright (inj 9); M. Geaney for J. Lyne (48); B.J. Keane for J. O’Donoghue (52); Brendan O’Sullivan for P. Murphy (57); C. Geaney for J. Savage (61), Barry O’Sullivan for D. Walsh (67); J. Barry (70+3, not replaced). Róghnóirí: Mikey Sheehy (Austin Stacks), Padraig Corcoran (Dingle), Liam Hassett (Laune Rangers), Maurice Fitzgerald (St Marys). DONEGAL (FL v Kerry): MA McGinley (St Michael’s); E Gallagher (Killybegs), N McGee (Gaoth Dobhair), P McGrath (Ardara); R McHugh (Kilcar), C Ward (St Eunan’s), P Brennan (Bundoran); J McGee (Cloughaneely), H McFadden (Killybegs); C Thompson (Naomh Conaill), M Langan (St Michael’s), M O’Reilly (Seán Mac Cumhaills); P McBrearty (Kilcar), M Murphy (Glenswilly), J Brennan (Bundoran). Galway and Cork drew (0-14 to 1-11) in Round 1 of the Allianz Football League Division 2 on Sunday February 5th at Pearse Stadium Galway. Cathal Sweeney’s 73rd minute point earned Galway a share of the spoils in this Division 2 Allianz football league encounter. Two Colm O’Neill points either side of a Ruairi Deane effort had Cork 1-11 to 0-12 in front heading into the four minutes of additional time. Cillian McDaid halved the deficit, with Sweeney popping up with the equaliser a minute later. Cork were awarded a free at the death, but Colm O’Neill’s kick tailed right and wide. O’Neill was outstanding upon his introduction and kicked four from play. Cork enjoyed a narrow interval advantage, 1-3 to 0-5, but should have been further clear as nine wides were clocked. Paul Kerrigan supplied the Cork goal on 18 minutes after good build up play by Luke Connolly, Aidan Walsh and Sean Powter. It was only their second score of the half after Luke Connolly opened their account after 16 minutes. Galway were largely on the dead ball accuracy of Barry McHugh who supplied three of their 0-5 total. The home outfit pressed on the gas at the start of the second half with points from McHugh (two frees), Danny Cummins and Paul Conroy taking them 0-9 to 1-3 clear. Niall Coakley, Colm O’Neill and John O’Rourke brought the visitors back level and it was nip and tuck from there to the finish. Scorers for Galway: B McHugh (0-6, 0-6 frees); D Cummins (0-2); G O’Donnell, P Conroy, D Kyne, C Sweeney, C McDaid (0-1 each). Scorers for Cork: C O’Neill (0-5, 0-1 free); P Kerrigan (1-0); M Collins (0-2); R Deane, N Coakley (0-1 free), L Connolly, J O’Rourke (0-1 each). Subs: C McDaid for Brannigan (43 mins); M Daly for Armstrong (45); E Tierney for Flynn (51); C Sweeney for Heaney (70); P Cooke for Day (71). Galway (Allianz FL v Cork): Rory Lavelle; Declan Kyne, David Walsh, Luke Burke; Gary O’Donnell, Gareth Bradshaw, Johnny Heaney; Paul Conroy, Fiontan O Curraoin; Thomas Flynn, Damien Comer, Eamonn Brannigan; Danny Cummins, Barry McHugh, Seán Armstrong. The Cork Senior Football team to play Galway in the Allianz Football league next Sunday in Pearse Stadium, Salthill, Galway has been announced as follows.